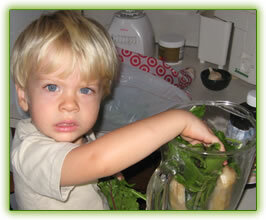 Jonny's "favorite" Green Smoothie - Got Greens? 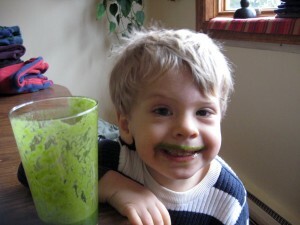 As most of you probably already know, our son Jonathan (“Jonny”) has been drinking green smoothies since he was about 10 months old and loving them. He has been helping make green smoothies since he was old enough to sit on the counter and stuff in the greens at about 1 1/2 years old. We went on a camping trip when he was 2 1/2, when we asked him what he wanted to eat while we were camping he said “gree smooie”. It was because of him we brought along our manual, hand crank juicer so that we could make his daily green smoothie for him while we were camping. 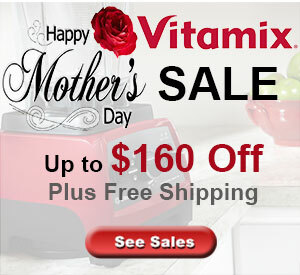 While we were doing a recent 30-day green breakfast challenge he surprised us one morning. When we got out of bed he approached us and said “I’ll make the green smoothie this morning for us”. And he did. That started his initiative to make them on his own. 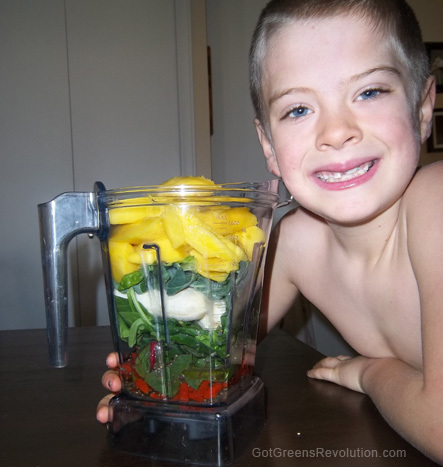 While Jonny does prefer some green smoothies over others, and he doesn’t care for Dad’s super green with lots of dandelion, the truth is he has many many favorites. We always make it a point to ask him how his green smoothie is. His responses over the years have been darling. Some of them you’ve read here on our blog, like “This is too yummy to share”, and “This is the best smoothie I ever had in my life”. That doesn’t stop him from saying “That’s the best green smoothie ever! It’s my favorite”. 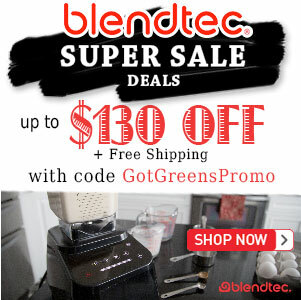 As parents, the joy in our hearts is huge knowing that he is not only eating so well and making wonderful food choices on his own, but he also is motivated to make green smoothies for his family and share them with his friends. Thank you Jonny for being you and bringing more sunshine in our life everyday!